If knowing how to get what you want and achieving personal growth were easy, the whole world would be very different. There’d be nothing standing in the way between you and reaching your life goals. You and everyone else would be beautiful, healthy, have plenty of money, live in your dream home, and have deeply connected relationships. Instead, many women view their life goals as challenges and, therefore, subconsciously start thinking of them in negative terms. Doing this psychologically programs your subconscious mind for self-sabotage, instead of empowering you to live your dreams. 1. Recognize your innate energy. The universe runs on energy, and so do you. Your underlying feelings and beliefs are much more powerful creative energy than the words you say or actions you take. It’s all about emotion — your most powerful creative energy that is working 24/7 to either empower or weaken you. 2. Tap into your underlying emotions. Your words and thoughts are wrapped in emotion. Perhaps the word “divorce” gives you a negative feeling because you know how painful it is but your friend may have a positive response because divorce freed her from a toxic relationship. It’s that underlying emotion surrounding your words and thoughts that get you what you want … or what you don’t want if those feelings are negative. In order to fast-track your success, you need to know EXACTLY what you want. Then, visualize already having it. Include all the details and make it colorful to give it life and vibrancy. 4. Feel the emotions of already having what you want. This is the most important key in getting what you want, but most people tend to miss it. Your emotional energy — positive or negative — works day and night to create more of what you’re feeling. That means you want to keep the positive emotions going strong. Think of anything that has brought you happiness, love, and joy and feel those feelings often. If you feel as though your present situation doesn’t warrant any such good feelings, that’s OK. Do it anyway. It may feel a little weird in the beginning, but keep it up! The point is to improve your current life situation — and get what you want. Bring the feelings you want to feel daily to the forefront of your heart and mind as often as possible. You can do this and you’ll feel better, instantly. Unfortunately, there is also a kind of disconnect and then subsequent self-sabotage that happens with most people daily (or even hourly) on all different topics. For example, you want to lose weight and heal your body so you pretend to love kale and choke down a terrible tasting “healthy” shake. If your underlying beliefs (wrapped in emotions) are that you are overweight and unhealthy, even your best eating habits won’t help long-term. Energetically, they can’t. It’s a disconnect between your actions and what you truly feel and believe on the inside. What you can do to heal your body quicker is to visualize already being healthy, along with all the vibrant colors and details and feelings you would experience if you already had the health and body you want. For example, if you are at 160 lbs and want to weigh 120, visualize yourself at 150 first. When you get to 152, visualize 140, and so on. Having dreams is great, and you can create them in reality. Just remember they need to feel believable. Then, grow your dream like a flower, every step of the way. There’s no need to know “how” you’ll get it. It may happen as you expected or come from another direction completely. What does it feel like to already have it? List at least 5 emotions. And if you don’t know how it would feel, imagine it and borrow feelings of love, happiness, or success from other events in your life. Is it a giant step from where you are? If it is too big of step, you may not believe you can achieve it and subconsciously self-sabotage. Be very specific about what you want. This isn’t necessarily the easiest part, but you will feel so good when you have figured it out with all the details! Clarity helps you get where you’re going. “I want to be strong and healthy and have a great relationship” is vague, vague, VAGUE! Yet, this is what most people visualize, and it’s the reason why they don’t achieve what they want. A lifetime of that will rob you of dreams altogether. What does “strong” mean to you? Is it hiking for 2 hours and still feeling great? Or working out three times a week and feeling strong and toned every day? Maybe you and your partner have empowering conversations, wonderful intimate time twice a week, and send each other loving and supportive messages 5 times a day. Be specific! You wouldn’t order “lunch” at a restaurant. You would order a Cobb salad with iced tea and chocolate volcano cake for dessert. And when you’re ready, you can get the ball rolling! Close your eyes, breathe deeply and slowly to relax your body. Visualize ALREADY having exactly what you want, with all the emotions that would come with it. Picture celebrating your success with family and friends. How does that feel? Stay there for 17 seconds or longer for your emotional energy to start the physical manifestation process (that’s how energy works). Then, revisit this vision with even more detail and stronger feelings a few times per day. This keeps the energy flowing in the right direction to get what you want. One powerful way to get what you want is clearing the emotional baggage from the past that’s getting in the way of your dreams. 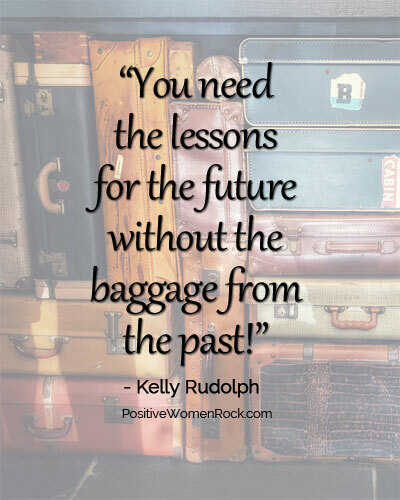 You need the lessons, not the baggage. Your emotional baggage has snowballed and combined with that of generations before you. Yep. It’s BIG. And it can be quick and painless to release over the phone with a well-trained, experienced generational energy healer/guide. You can see how doing things just a little differently can make a huge impact. You don’t have to know how you will get what you want. Just focus on what you want in detail with the positive emotions of already having it. Allow your subconscious energy to empower you by keeping it positive. 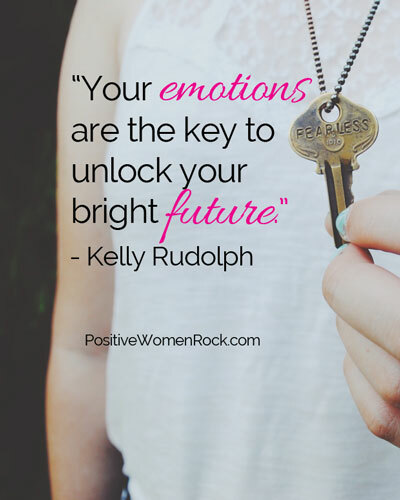 Hi, I’m Kelly Rudolph, founder of Positive Women Rock, and I guide women from stuck and stressed to clear and confident by releasing emotional baggage and using energetic tools to create the life, love, and health they want. Connect with me and get my Free Life Strategies now.